Figure 1. 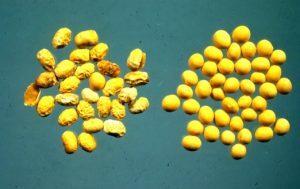 Soybean seed affected by Phomopsis seed decay on the left compared to healthy seed on the right. As the rain continues in Wisconsin and the 2016 soybean harvest gets delayed longer, Phomopsis seed decay is going to become an increasing concern. Phomopsis seed decay (Fig. 1) of soybean is caused by the fungus Diaporthe longicolla which is the same fungus that causes pod and stem blight (Fig. 2). This fungus also causes “zone lines” that are often observed in split stems and tap roots. These “zone lines” were once thought to be cause by the charcoal rot fungus, but we now know that is incorrect. You can learn more about “zone lines” by CLICKING HERE. What does Phomopsis seed decay look like? The fungus that causes Phomopsis seed decay can infect soybean plants early in the season and colonize pods and infect seeds near, or at maturity. Infected seed will often be shriveled or undersized (Fig 1.) and can have a white or chalky appearance. If pods are opened in the field a white cottony “mold” (different than that of white mold) can be observed. Infected seed can pass the Phomopsis seed decay fungus on in seedlings of the next soybean crop. Therefore, it is important to identify Phomopsis seed decay especially in soybean-seed fields. What conditions are favorable for Phomopsis seed decay? Figure 2. Symptoms and signs of soybean pod and stem blight. Warm and wet weather during pod fill and maturity favor the development of Phompsis seed decay. The conditions were prevalent throughout much of the state in of Wisconsin in 2016. Soybean varieties that matured early are also more prone to Phompsis seed decay. Other stresses such as nutrient deficiencies or virus infections can also increase the occurrence of Phompsis seed decay. 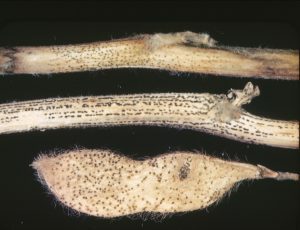 Infested seed is a likely source of Phompsis seed decay, however, the fungus can survive on soybean debris and certain weeds like velvetleaf. How should I handle soybeans with Phomopsis seed decay? Scout fields before harvest to get an idea of how much Phomopsis seed decay you might have in a field. Scout multiple plants in at least 5 locations in a field, opening pods to determine if Phomopsis seed decay is present. In fields where Phomopsis seed decay is observed, harvest should be prioritized as soon as combines can enter the field. Seed infected with the Phomopsis seed decay fungus will continue to rot in the pod until they are harvested. How should I manage Phomopsis seed decay in the 2017 soybean crop? Harvested grain intended to be seed for the 2017 crop should be cleaned thoroughly and undersized or damaged seed removed. Seed with an extremely high incidence of Phomopsis seed decay should not be used. Using a fungicide seed treatment may help improve emergence of infected seed. Resistant soybean varieties should also be used. Choose later maturing varieties appropriate for your location. Earlier maturing varieties tend to be more susceptible to Phomopsis seed decay. Finally, cultural practices such as rotation (corn or wheat are preferred) and tillage to manage infested residue should be considered in high-risk fields. A fact sheet about Pod and Stem blight and Phomopsis seed decay has been developed by a consortium of soybean extension pathologists. You can download that fact sheet by clicking here.